How Do You Waterproof Basements with Monolithic Foundations? What is the Solution for Monolithic Foundations? DryTrak® is designed to solve water leakage in monolithic foundations. One of the most effective and least invasive methods of waterproofing a basement is with a baseboard system, such as Basement Systems' DryTrak. With this system, weep holes are drilled into the floor/wall joint or, in the case of a block wall, into the walls themselves. Once this is done, a hollow vinyl baseboard is epoxied to the floor. The water creating hydrostatic pressure on the foundation walls is directed into the system and drained to a sump pump system. The sump pump is installed with a feed pipe to the sump. The sump pump then discharges the water out of the house through a drain pipe that's buried and runs across the yard. The pipe extends past the backfilled soil and is directed to a location where the water can run downhill and away from the house. One the water is away from the foundation walls, the hydrostatic pressure created by it is relieved. This method is only used in the case of a monolithic floor or in other rare instances. 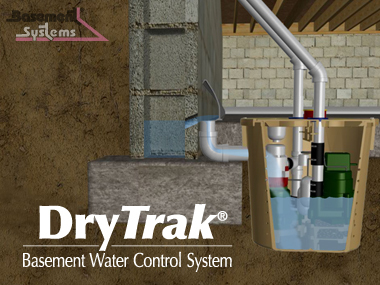 DryTrak® is the least disruptive of installations and will never clog or affect the foundation structurally.